How about creating schools with more purpose than test scores and letter grades? 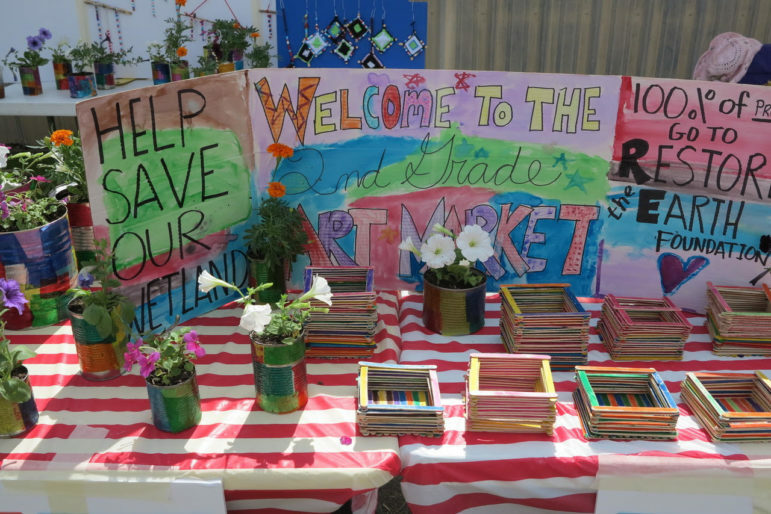 Second-graders at Young Audiences Charter School in Gretna sold art work to raise money for wetlands restoration during the author’s tenure as principal. I got my start in education as a Peace Corps volunteer in southeastern Ecuador. I lived and worked in a small rural community. Moya had a tiny school with about 45 students in kindergarten through sixth grade. There was one teacher and two part-time parent volunteers. It was an adobe version of the little red schoolhouse that figures in stories of the American frontier. During the day, the children studied the basics: reading, writing and arithmetic. But they also had to work, and there was a lot to do: tend the garden, pick up the eggs, milk the cows, look after the school’s sheep and goats, keep the schoolhouse clean and tidy, help prepare breakfast and lunch. Since there was only one teacher, the older students spent time reading with the younger ones. The students also participated in mingas. A minga is an Andean version of an Amish barn raising. The entire community would come together to tackle large tasks, from repairing irrigation canals to carving out hillside terraces for crop cultivation. Whenever possible, the teacher tried to incorporate skills and knowledge from the curriculum into the various chores. She asked the kids to estimate the number of ripe cherries on the capulin trees, to describe the behavior of the various animals in their journals, and to divide up ingredients and portions for meals. She always challenged them to come up with the most efficient way to complete each task. Her 7th and 8th grade students spend 20 percent of each week designing and implementing individual and small-group service-learning projects. 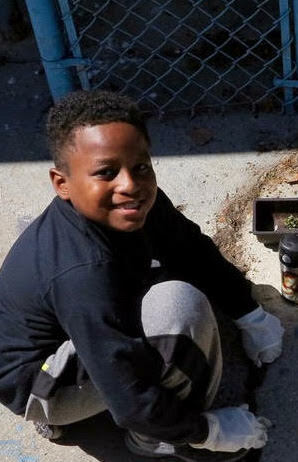 Curriculum tie-ins aside, the chores instilled a sense of responsibility and community. They helped the kids develop discipline, a work ethic, and strong habits of mind. They also nurtured increasingly important workplace skills like collaboration and communication. I noticed that the kids seemed more motivated by chores that had a direct impact on their daily lives. When I returned to the United States and became a teacher, I tried to incorporate some of the lessons I learned in Ecuador. One of these was to make the learning relevant or purposeful. My kids had little interest in the history of Louisiana, let alone the ancient world. (Maybe, I would have had more luck teaching fashion, dating, or contemporary music.) Finding connections to the real world was a challenge in itself — and then there was the need to “cover” a myriad of Common Core topics in impossibly short 50-minute periods. I had my kids take oral histories from war veterans, write letters to the editor of the local paper, teach “lessons from the past” to younger students, and suggest policy changes to politicians (alas, mostly ignored). 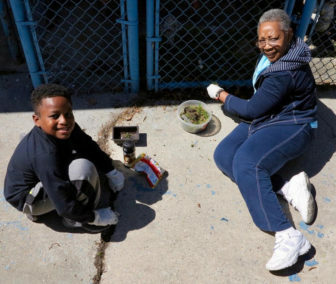 Parents join their children to participate in school beautification days. I was working in a private school, so I had some latitude. One time, I took a group of middle- and high-school students to clean up a nearby swamp. There was a recreational area near the highway that was littered with trash. We filled up more than a hundred garbage bags in less than a day. “No,” I said, “draining is actually one of the problems.” I then rattled off a litany of reasons for protecting and preserving fragile wetlands. While my argument to clean up the swamp may have irked a few parents, the confrontation actually strengthened my resolve to make learning more purposeful. Today, whenever I visit a school as an educational consultant, I always ask the kids, “So, what are you learning today?” I immediately follow-up with, “But why? No, seriously!” If the answer is, “Because my teacher is making me” or “because it’s on the test,” I know the school (and its kids) are falling short. Stanford Professor William Damon defines purpose-oriented schooling as “a stable and generalized intention to accomplish something that is at the same time meaningful to the self and consequential for the world beyond self.” In his book “The Path to Purpose,” he cites research showing that a school day spent purposefully can improve sleep, reduce stress, and increase motivation among students at all grade levels. If I were standing in Trump Secretary of Education Betsy Devos’s shoes (god forbid! ), I would propose that all students spend at least a third of their schooling engaged in purposeful, real-world learning. The work would be divided into roughly four categories: daily tasks, community service, entrepreneurship and apprenticeships. A school is like a small city. To make it hum, all kinds of things have to happen. From mowing grass and sweeping halls, to monitoring the playground and sharpening pencils, kids should be involved in these tasks. In addition to daily chores, there are also ways for kids to “add value” to the learning environment. 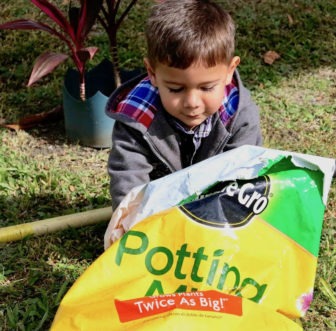 Potting plants for display around the school gives kids a sense of accomplishment beyond the classroom. During my time as principal at a school in Gretna, for example, we held school beautification days, designed and built an outdoor puppet theater, created “road signs” for the sidewalks and hallways, painted educational murals, and planted butterfly and rain gardens. I’ve also worked with schools that had students “intern” with teachers, administrators and custodians. They learned what it really takes to operate a school. When kids invest in their own education, they tend to get more out of it. It’s a win/win. Rural Ecuador had its marvelous mingas, but in the U.S., as in most developed countries, we rely on the government to do community improvement projects. Still, there are plenty of worthwhile projects that government doesn’t do. From picking up trash and removing graffiti, to tutoring younger learners and spending time with people in assisted living, there are all kinds of opportunities to make a difference. I was the founding principal of an arts-integrated elementary school. Every day, our kids created original works of art, wrote and performed plays, and composed and sang songs. The challenge for us was to find an audience for our creative learners – an audience beyond the classroom. So, we held regular Exhibitions of Student Learning, performed at festivals and fairs, submitted work to juried shows, published stories, poems and plays on sites like Canvas and Celebrating Art, shared digital works with other schools via online galleries, and actually sold pieces on sites like Artsonia and Etsy. The students did the kind of things that real artists do. Likewise, the growing Maker movement challenges kids to become real inventors and designers. It gives their effort more value than an arbitrary letter grade. 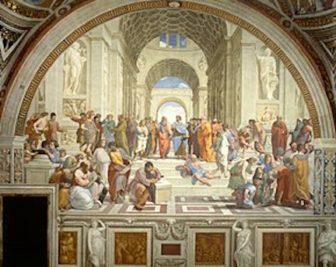 Raphael’s painting, “The School of Athens,” imagines an academic utopia, but with lessons for today. Learning through apprenticeships is older than the School of Athens. Obviously, it works. Alumni include Leonardo da Vinci, Abraham Lincoln, Benjamin Franklin, Stella McCartney, and Jamie Oliver. Doing purposeful work with a mentor who does something extraordinarily well is a powerful and impactful experience. We could certainly use more apprenticeships in (and out of) the classroom. Note: Educators love the expression, “If it doesn’t get measured, it doesn’t get done” — hence, all the standardized tests. Purposeful work can and should be measured as well, only differently. Appropriate assessments include performance tasks, portfolio reviews, and self-assessments. The work or demonstrations of mastery can help students get into a program or university, land a show, an internship or even a job. They definitely have value beyond the classroom! So, can it be done? In many schools, it’s already happening. I have been coaching a middle-school social studies teacher in South Carolina. She recently implemented a program called 20Time. Her 7th and 8th grade students spend 20 percent of each week designing and implementing individual and small-group service-learning projects. Her kids have started GoFundMe campaigns, volunteered with local charities, and created multimedia presentations to teach their schoolmates about important issues. They have written and pitched business plans and have come up with innovative solutions for difficult problems. School children on Grand Isle join with the Nature Conservancy to plant grass that holds dunes together. A school that did just that is New Harmony High, a.k.a., The School on a Barge. This new Louisiana charter school takes the “20Time” idea to a whole new level. Its mission is nothing less than helping to save Louisiana’s disappearing coast. To that end, the school is building a curriculum that blends Common Core Standards with project-based teaching and learning. 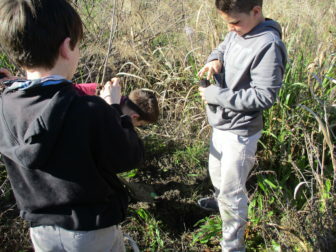 New Harmony’s budding ecologists plan to work side by side with engineers, biologists, community activists, politicians and the like to come up with solutions for real-world problems. Here’s hoping they succeed! Our future depends on it. In his 18th-century satirical classic “A Modest Proposal,” Jonathan Swift argued that an excellent way to relieve Irish poverty would be for the poor to sell their children as food for the rich. It was a preposterous idea, but, of course, that was the point. In the age of standardized curricula and high-stakes testing, carving out time for kids to “work” during the school day might seem no less preposterous. A latter-day Swift would dream up a union organizer harshly condemning the idea as a violation of child labor laws.